Mike Ferullo (right) on a run in 2013. Running has never just been running to Mike Ferullo. The miles he’s racked up have been a path to recovery, a road to redemption, and, most recently, a way to give back. Ferullo is the founder of the Boston Bulldogs, a running club with addiction recovery at the heart of its mission. 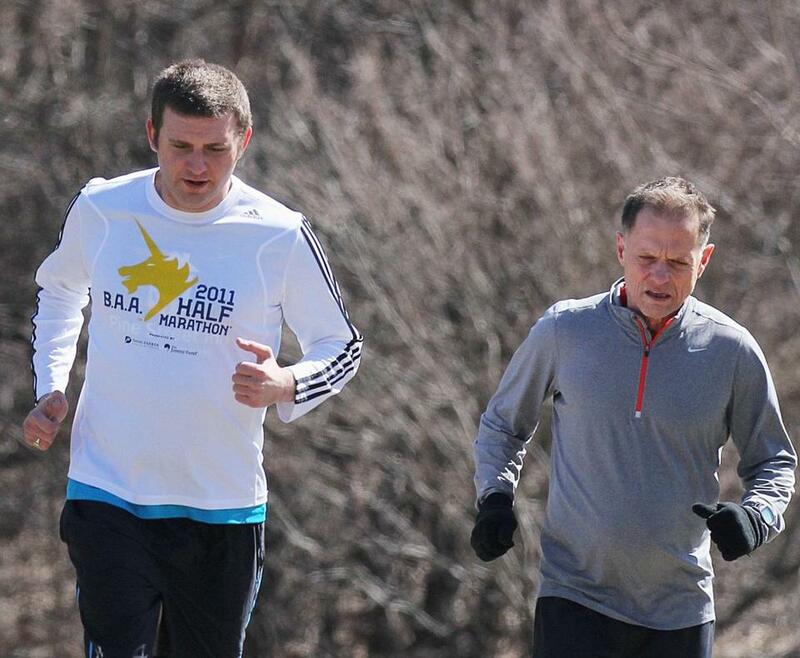 It is a nonprofit with four chapters and 200 members, 10 of whom will run a couple of weeks from now in the 2019 Boston Marathon. But to understand Ferullo’s love for the sport, and his belief in what it can do, it’s necessary to go back a few decades, to the person he used to be. Ferullo, 70, grew up on the streets of the North End and, later, Hyde Park. By his own account, he was good at finding the wrong people to hang with, and the wrong things to do. By eighth grade, school was an afterthought. By his late teens, he was an addict and a small-time criminal. He was hustling to survive. He was a tough guy who wasn’t really a tough guy, a street kid privately consumed with fear. As the young man bounced in and out of trouble, he searched for a fresh start. Ferullo tried to get off drugs and booze, and drifted away from his former associates. He got clean at the old Boston State Hospital in Mattapan in the late 1970s. He made it to UMass Boston and then to graduate school. For an eighth-grade dropout, it was a struggle — “I could barely read,” he says — but he was determined to build a different life. Ferullo became a social worker and a psychotherapist. He moved to Chestnut Hill. And he became a committed runner. The high it gave him, the boost to his self-esteem, the discipline — it all helped instill a new sense of self. Eventually, Ferullo’s passion for recovery — which had become the backbone of his professional life — and his love of running intertwined. He hit the road with guys in early recovery at the Lemuel Shattuck Hospital in Jamaica Plain and at the Pine Street Inn. By 2008, those informal commitments grew into a formal organization that would provide people in recovery, as well as those affected by it, much-needed structure and support. It’s grown into a tax-exempt nonprofit that Ferullo envisions eventually expanding beyond Massachusetts. Ferullo preaches showing up, building self-awareness, and giving back to the community as principles that will help addicts recover and lead productive lives. Those principles come from his own recovery decades ago, as well as the Buddhist philosophy he’s embraced more recently. As Ferullo sees it, the running club is a way of creating a community — the kind of network that people in recovery often lean on, as they leave old habits and relationships behind. “I’m using getting people together and using these three principles, and I see the running club as an adjunct to the things people need to do in their recovery,” he said. Ferullo won’t be running the Marathon, but he’s still very much a runner. He has a half-marathon coming up this spring, and he insists he hasn’t made his last 26.2-mile run. He’s still seeing patients as a therapist, as well. Slowing down seems foreign to his mindset. “I’m trying to be a role model to these younger people that you can look good and feel good and still do amazing things,” he said with a chuckle. In his eyes, the Bulldogs are only partly an athletic group. It’s also part of a movement to transform troubled lives.